Here's a modeling note. Evans Designs 1.8 mm red leds can be fitted in Walthers Proto Amfleets as marker lights with some adjustments to the body and "B" end; a diode for direction illumination and a resister - perhaps 100 ohms - as they are very bright. They handle up to 19 volts. epspsy wrote: Here's a modeling note. Evans Designs 1.8 mm red leds can be fitted in Walthers Proto Amfleets as marker lights with some adjustments to the body and "B" end; a diode for direction illumination and a resister - perhaps 100 ohms - as they are very bright. They handle up to 19 volts. 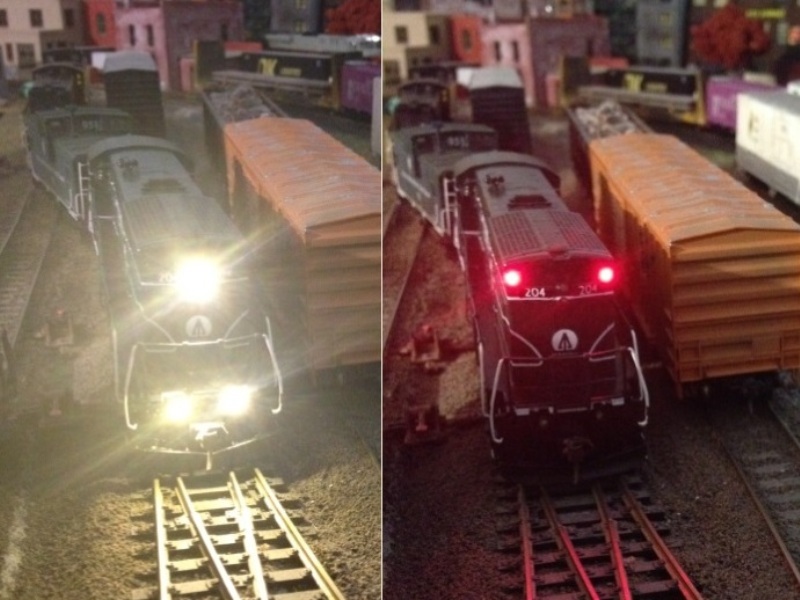 I'm a big fan of the Evan Designs pico chip sized LEDs (http://www.modeltrainsoftware.com/smd-chip-leds.html) which are pre-wired with a 7-19v AC/DC rectifier and resistor. They require very little if any body shell modification beyond drilling holes in the appropriate places; the LEDs are tiny and are attached to a length of magnet wire between the LED and resistor/rectifier. The LEDs can be secured in "lenses" made with Micro Krystal Kleer and the wires taped with the tape of your choice. Even with the pre-wired resistor, they are very bright! I don't find the brightness to be particularly distracting; headlights and markers are supposed to be bright!